We all have that one person on our list that is hard to buy for. Opa is like that. Therefore, Oma usually has to resort to a gift of cash. Everyone likes to receive cash, but it is not that exciting. The Money Maze Puzzle puts an end to that dilemma! This 3x3x3 box comes in two colors options; blue or green. It really adds a bit of class and uniqueness to a cash gift. The puzzle is not too hard to solve so will not frustrate the recipient. My only constructive denunciation would be that it would be better if the puzzle’s opening could be big enough to accommodate a gift card. However, this puzzle would work wonderfully with cash, jewelry, event tickets . . . . A really cute and fun gift giving idea! No More Boring Envelopes: Your friends and family deserve a little more fanfare than impersonal birthday cards. It's affordable for the giver, awesome for the recipient, and can be used again and again. 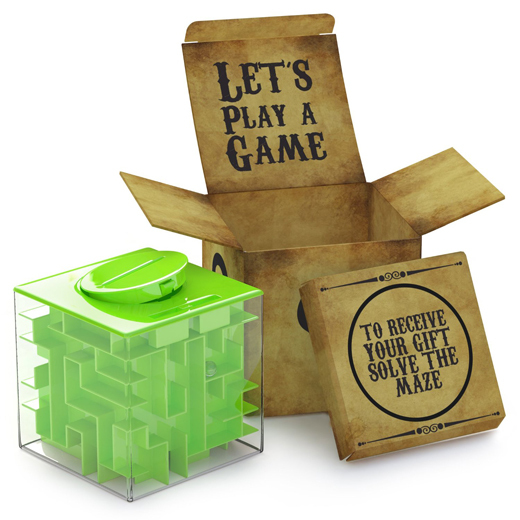 • Receiving the Gift is Half the Fun - Combine puzzle games and gift boxes into one with this gift holder puzzle box. It's a fun, cool way to give a gift. 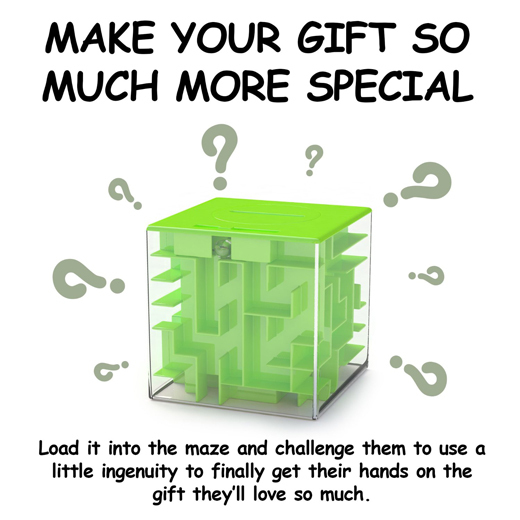 • Make Them Work for Their Gift - It's ideal as unique birthday gifts for the adults and kids in your lives who love brain teasers, or use it as a funny gag gift to make your teenagers use a little ingenuity and logic to get to their cash. • Great for Christmas and Birthdays - Sometimes cash or gift cards can seem like last minute gifts. But when you include a small puzzle box game, suddenly an inexpensive accessory makes your gift the most popular! • Fun for Kids - These game and toy maze boxes are a challenge for kids, without being too hard to crack or too easy to be boring. Once the puzzle is solved and the gift is retrieved, it can be used as a coin box or secret storage. • Stock Up Now - Pick up these epic gift givers while they're deeply discounted! They are great for small gifts for men, women, teens, boys and girls. It's also perfect for small gifts like concert tickets and even jewelry. Your search for perfect gift is over. Order now, add several to your cart.